Congrats to thorsini for the winning entry and 50 duck prize. Thanks to everyone who entered and voted! Here are the final results of the Caption this Drawing caption contest. "Go home Drawception, you're drunk." The D stands for "drinking problem"
Insert a very clover caption here! "Wait! I've drawn your pint, sir!" "irish i had more beer"
Remember last St. Patrick's day? Me neither. Even logos need beer some days. And the Drawception ran away with the drink. Uh oh! Those kids are after me lucky Guinness! It's the Guiness fairy! Bibbity bobbity BEER! You'll Never Get Me Lucky Charms! Alright kids. What does D stand for? Drunken. Drawception: IRISH you a happy St Patrick Day! They're Always After My Lucky Beer! D's running late for the St. Patrick's party! "Oh fooey, the pub be closing at 6PM SHARP!" The luck of the D-rish! You'll never get me lucky pint! Shoot! I Never Payed For This Guiness! Draw not, I think, for 'D' is for "drink!" Happy St. Patrick's Day from Drawception! Quick! Let's fly to the US to celebrate again! Run D, Run! The green blob is gaining on you! They're after D's Lucky Charms! ... and beer! Let me finish my beer and I'll start to draw! They're always after my Lucky D! I'm not irish, but kiss me anyway. Drawception D is late for the Irish Party. "May the luck o' D be with ya!" Leprechaun Drawception is late for the party! Drunk (in love?) on St. Patricks Day! Ye old D, on his merry way, Guinness in hand! Dastardly D steals a brew! Irish D can resist anything but temptation. Drawception gets drunk and has clover wings. Ginger D wears tacky hat and gets drunk. Mugged hand, hatted head, DC'll never be dead. Run! The beer police are after me! Drawception celebrates St. Patricks day. D became an alcoholic leprechaun. Drawception has stolen St. Patrick's Day. Run! Woo! Ready for next year's St Patrick's day!! Happy St. Patrick's day drawception! The Wild Leprachaun in it's natural habitat. A thief's got me golden pot of drawings! Drawception Swigging a Pint of Irish Guinness! I'll take this pint to go, Lassie! Mr. O'drawception runs. He is lucky and fast. Racing to the next pub lads. Ye ol' St. Drawception is at it again. Lá 'le Padraig sona daoibh, ó Drawception! It's the Irish beer-loving Drawception D! Yadelee yadelee do! Drawception is BURP! A really really nice hat, on a D or whatever. Ahf tah see da wizzerd!! Guinness makes the Irish D's come fast. Im 100% luck prepared for st patricks! st.pattys day drunk drawception time!!! They're after me Lucky Charms and Guinness! I'm not paying for the Guinness! 'D' is ready for ST.Patrick's day. Run, don't walk! Buy Guinness Drawught! St. Pat-D's Day on Drawception! Let me sing a shanty with my boys in green! Mr. D is a leprechaun!? 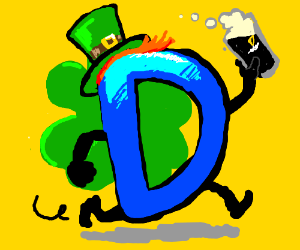 The Irish are all about the D! better get some lucky charms while im at it! This sure is a lot of irish liquor! D: Irish you a happy St Pat day! drawception saint patricks day celebration. Drawception's Happy st patrick's day! Hurry up, run to pub! Drawception on saint pat's day awsome. Drawception logo on saint patricks! Drawception is off to get drunk! Here's a toast for St Patty's day! Unluckily, my glass slipped my hand! Drawception logo with beer and is a genger. Drawing for luck,yet I need more luck! D pretends to be SpongeBob while holding beer. Drawception grew green wings! Let's celebrate! The Irish Drawception D with sports drink. Dave the Drawception D Is a Leprecaun! Saintpatricks day. Just call it beer day!